Subjects, styles, advertising, other relevant information: In all probability this is the studio of one of the Wisbech photographers listed on this site. For the moment it is not known which photographer operated this studio - census returns for 1881,1891,1901 and 1911 do not show any photographers resident in Field Rd. This entry has arisen from the discovery of the cabinet photographs shown below. The first photograph is in poor condition on a black card mount, printed in silver, the printing having faded to the point of illegibility. On the face of the mount is written "Victoria Studio Field Road, Wisbech". The photo depicts what appears to be a teenaged girl dressed in a double breasted trouser suit, cap, patent shoes, and holding a long stemmed pipe. Overall the impression is that this is a studio portrait of a young actress. The reverse of the mount, printed in faded silver on black has some sort of logo top right - on which is written " And don't you forget it". The text continues, "The Victoria Studio, Field Road, Wisbech, near the GER station. Artistic Photography by the instantaneous fast, modern and permanent processes. Photographs taken by appointment, wedding and garden parties, family groups &c. Terms on application. Amateur's negatives developed, printed &c. Lantern slides made from negatives, prints or drawings. Enlarging in bromide, carbon and platinotype. Finishing in black and white or colours. Tinting a speciality. 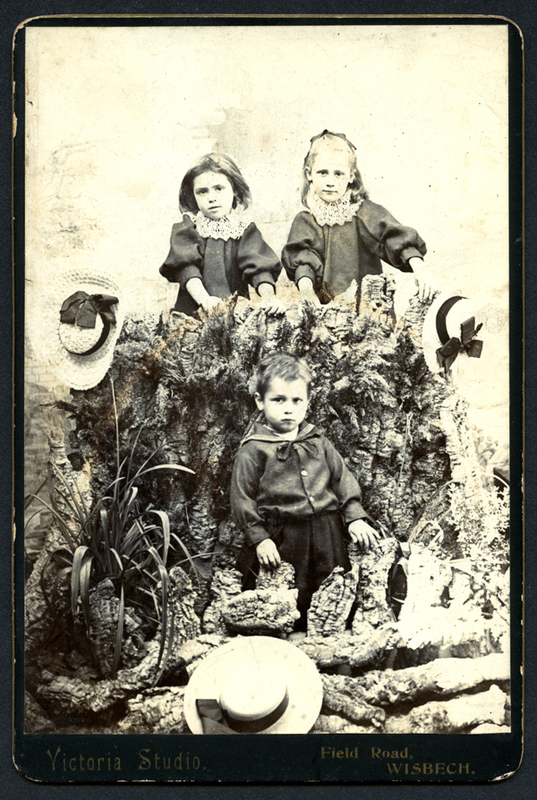 Distance no object", followed by another un-readable line of print.The second cabinet photograph of three unknown children is set up as some sort of woodland scene. The boy in the foreground is in a sailor suit. The setting and clothing and the simpler black card mount - reverse blank, suggest this is the older of the two examples. References: None at this point. Subjects, styles, advertising, other relevant information: In 1851 George was living in Norwich where he was a scene painter. His wife Adelaide was an actress and they had 2 young sons George and Alexander. Bernard and Pauline Heathcote list the places he visited as: Norwich 1852-3, Cromer, Holbeach, Leeds, Leicester, Worcester, Newport, Tenby, Torquay, Cardiff and Bristol. The Cambridge Chronicle of 14/5/1853 reports: "Photography - We observe that Mr Villiers late of Norwich and Edinburgh has been very successful in his Daguerreotype miniature portraits taken from a portable and very convenient gallery erected on the Market Hill. The faithfullness on the likenesses is very much admired and Mr Villiers appears to be well patronised." www.newportpast.com gives a comprehensive account of George Villiers' career with examples of work from his Newport Studio. In 1868 the Cambridge Independent Press (6 June 1868 P6), reported enthusiastically that Mr T Vipond had taken a photograph of 24 members of the Eton Socon District Cricket Club at St Neots. The club members were "arranged in various positions around the Pavilion and the portraits of each stood forth sharp, clear and distinct". 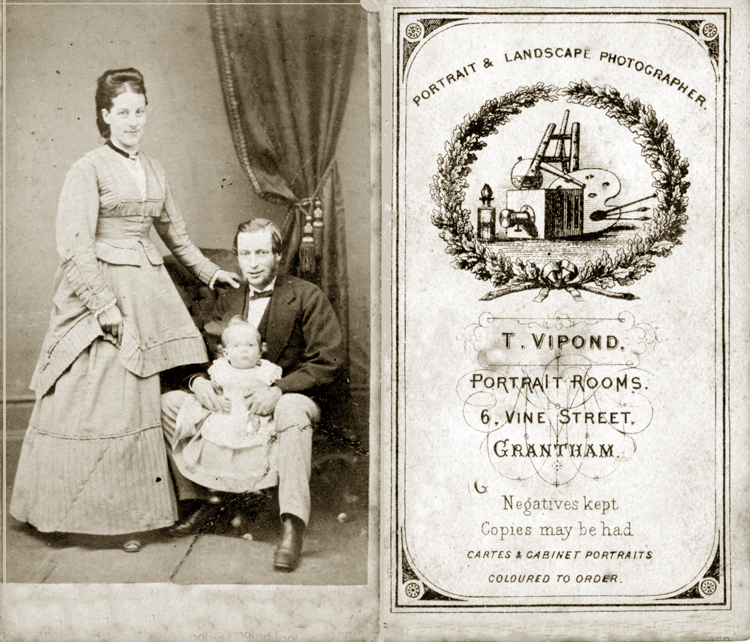 A few years later, Mr Vipond (no initial or first name shown), photographer, was operating a studio at Chatteris. He became involved in a legal dispute, Seward v Vipond. As well as being a photographer, Mr Vipond also dealt in musical instruments. He sold a piano to Mr Seward. It turned out that the piano had been sold to Mr Vipond by a third party who had not finished paying for it at the time. The Court cleared Mr Vipond of any fraud or dishonesty. (Cambridge Independent Press, 22 April 1871, p 7). We ware grateful to Nick Smith for alerting us to this photographer through this news report. There is a certain amount of speculation in linking what follows to the two records of Mr Vipond in Cambridgeshire. www.hertfordshire-genealogy.co.uk/data/postcards/publisher-vipond.htm records a travelling photographer, Thomas Vipond (1831-1913). According to the Herts Guardian, Agricultural Journal, and General Advertiser ( 8 Nov 1859 P3) Thomas was taking photographs at the Victoria Inn on the Market Place at Hertford in 1859. Thomas Vipond, photographic artist, appears with his wife Eleanor living in a van on the Edgeware Road on Census night in 1861. The Leighton Buzzard Observer and Linslade Gazette on Tuesday 19 May 1863 reported that photographer Mr T Vipond, who had spent the last three years in Aylesbury, was taking up a studio in Old Street, Linslade, Bedfordshire. The Leighton Buzzard Observer and Linslade Gazette mentioned that Thomas had a photographic Salon at the three-day Annual Club Feasts at Leighton Buzzard (Tuesday 06 June 1865 p4). The places of birth of their children suggest the Vipond family had been in Ampthill Bedfordshire in 1867 and Aylesbury Buckinghamshire in 1863-65. In January 1876 the Nottinghamshire Guardian reported that Thomas Vipond had been arrested on suspicion of embezzlement from a firm in Lancashire. (Notts Guardian Friday 14 January 1876 p6). Thomas was described as a young man, a photographer in the employ of his accuser. 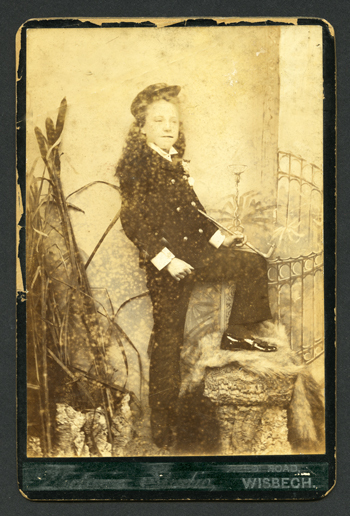 This would therefore appear to be Thomas Vipond b: 1859, son of Thomas b: 1831. In 1876 Thomas Vipond was listed in a local trade directory as a photographer in Moore St Union Rd Nottingham. 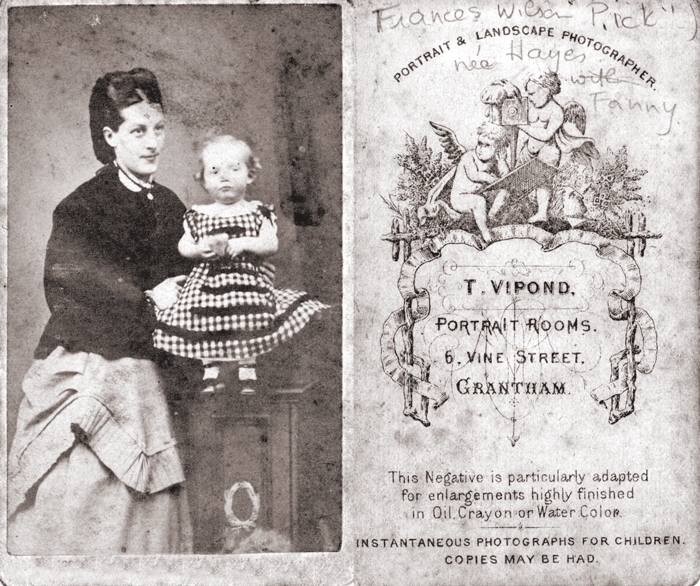 In 1877 Thomas Vipond was advertising magic lanterns for sale or hire, with over 2000 lantern slides available from his premises at 6 Vine Street, Grantham. (Grantham Journal - Saturday 06 January 1877 p1). The Stamford Mercury recorded that Thomas Vipond was the victim of a crime. Allen Neech was charged with stealing photograph cases and photographs, value 2/-, from his master, Thos. Vipond, Vine-street. The defendant, who had been Mr Vipond's apprentice for the past year said the articles were his own. Part he had brought from Cambridge, where he had been employed by Messrs Nicholls, and the others prosecutor's children had given to him. Neech was remanded for a week. (Stamford Mercury Friday 9 November 1877, p5 and Grantham Journal - Saturday 10 November 1877 p2). The following week the apprentice re-appeared before the magistrates, when his former master, Mr Ed William Nicholls, photographer and framemaker from Cambridge, identified the property as being sold by himself to Neech a year earlier. Neech had been employed by Nicholls for 14 months and he was satisfied with his work. (Grantham Journal - Saturday 17 November 1877 p4). It appeared that the theft charge was part of an ongoing dispute between Thomas Vipond and his apprentice Neech. A week later Neech brought an assault charge against Vipond for an incident earlier that month. The magistrates dismissed the case, ordering both sides to pay their own costs. (Grantham Journal - Saturday 24 November 1877 p4). 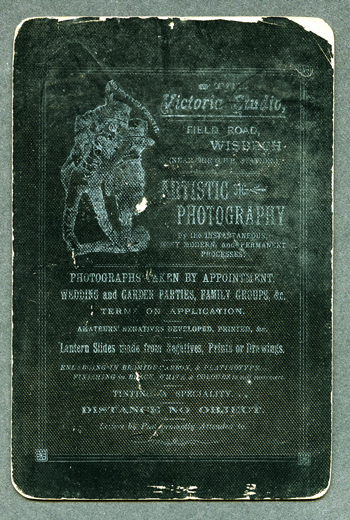 In May 1878 a new advertisement appeared in the press for Professor Vipond and Sons, Landscape and Architectural photographers at The Studio, King Street, Melton Mowbray. ( Rutland Echo and Leicestershire Advertiser - Friday 24 May 1878 p1). This was short lived and by September 1878 another photographer, Wood, Weale and Co from Leicester, had taken over the studio. (Rutland Echo and Leicestershire Advertiser - Friday 20 September 1878 p8). However, the title of "Professor" appears to have been used by Thomas occasionally from this point. In the 1881 Census, Thomas, shown as an artist, was a lodger at The Olde Ship Inn, Worksop. A number of cartes de visite and cabinet photographs have been seen bearing the photographer's name "Vipond" and an address at 19 Park Street, Worksop. In 1882 at Worksop a photographer by the name of Vipond, from Newark, sued Col Eyre of the Notts Rifle Volunteers for payment for £5 worth of photographs which he alleged the Col had ordered. The Colonel said he had only ordered two prints and the case was dismissed. (Sheffield Independent - Monday 13 February 1882 p 3). Thomas continued to work occasionally with the military and he advertised photographs of presentation of the new Colours at Belton Park on 13 June 1883. (Grantham Journal - Saturday 30 June 1883, p5). The Grantham Journal - Saturday 26 October 1889 p5, carried an advertisement for the sale by auction of furniture, musical instruments, photographic apparatus, photographs etc the property of Mrs Vipond. In 1892 and 1895 Thomas registered two of his photographs at Stationers' Hall, giving his address as 6 Bridge Place and 6 Bridge Street, Worksop. The Sheffield Independent - Thursday 14 March 1895 p 7 reported a court case in which Mrs Eleanor Vipond sued he husband Thomas, then a photographer and furrier living at Congleton Derbyshire, for maintenance, alleging that she had been deserted by him eight years previously after the couple had ten children. Eleanor received a court order of £1 per week maintenance against Thomas, who made little effort to keep up the payments and was imprisoned a year later for non payment (Sheffield Independent - Thursday 9 April 1896 p7) Did Thomas (or another of his dynasty) at this point return to his earlier locations? An advertisement in the Bucks Herald - Saturday 30 May 1903 p5: "VIPOND'S PHOTOS HAVE stood the Test for over 40 years. You can't have better or more life-like Portraits. Three Carte de Visites, Is., or 3/6d. per dozen ; three Cabinets,2/6d., or 6/- per dozen. Old Photographs copied and enlarged at the STUDIO, 21, Park Street (Dropshort), Aylesbury." Death of local worthy. Death has removed a familiar figure in Stafford in the person of Mr Thomas Vipond, of Mount-street, who passed away a few days ago at the advanced age of 87 years. He was chiefly known to the general public as the vendor of cough-drops and lozenges "Bromptons lung and chest relievers" he called them. He was a regular attendant at the Rangers' Football Ground during the match season and commanded a ready sale with his "foot warmers" the merits of which he acclaimed in a jocular and laconic style. "Cure your cold a penny a packet" was one of his favourite cries. A native of London, Vipond spent a great part of his life at Grantham, and migrated to Stafford several years ago after spending a good part of his time as a travelling photographer. He was a clever artist with a brush as well as camera, and executed numerous miniature water-colour paintings for local gentlemen. He was responsible for many published postcard views of Stafford and District, and was justly proud of his work as a photographer, having had the honour of photographing the late King Edward when Prince of Wales, and the late Mr Gladstone, besides many of the nobility. he was a widower with a grown-up family.